A prominent site is Glastonbury Tor. Glastonbury, a small town about 125 miles or 220 km west of London, is full of myth and legend. The town is known for its history, including Glastonbury Lake Village, Glastonbury Abbey, Somerset Rural Life Museum, and Glastonbury Tor. There are many myths and legends associated with the town. Glastonbury is notable for myths and legends concerning Joseph of Arimathea, the Holy Grail and King Arthur. The legend that Joseph of Arimathea retrieved certain holy relics was introduced by the French poet Robert de Boron in his 13th century version of the grail story, thought to have been a trilogy though only fragments of the later books survive today. The work became the inspiration for the later Vulgate Cycle of Arthurian tales. 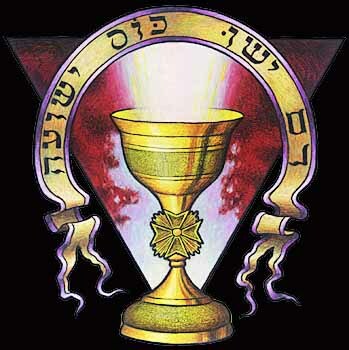 De Boron's account relates how Joseph captured Jesus' blood in a cup (the "Holy Grail") which was subsequently brought to Britain. The Vulgate Cycle reworked Boron's original tale. Joseph of Arimathea was no longer the chief character in the Grail origin: Joseph's son, Josephus, took over his role of the Grail keeper. The earliest versions of the grail romance, however, do not call the grail "holy" or mention anything about blood, Joseph or Glastonbury. Stories of a sacred vessel dear to the Celts became entwined with the story of Christ's Last Supper and the Christian Holy Grail which inspired quests and crusades across England, Europe and the Far East. The Glastonbury and Somerset legends involve the boy Jesus together with his Uncle, Joseph of Arimathea building Glastonbury's first wattle and daub church. These legends gave rise to the continuing cult of the Virgin on the site of the present Lady Chapel and inspired the title 'Our Lady St. Mary of Glastonbury,' which is still used today. 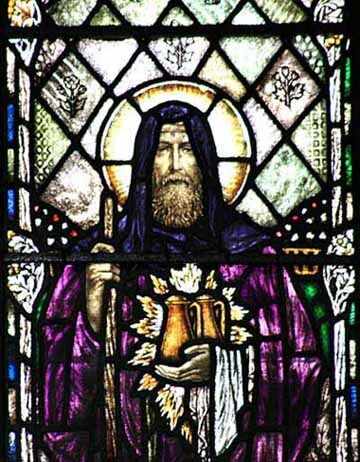 After the crucifixion of Jesus, lore has it that Joseph of Arimathea (who according to the Bible donated his own tomb for Christ's interment after the Crucifixion) came to Britain, bearing the Holy Grail--the cup used by Christ at the Last Supper and later by Joseph to catch his blood at the crucifixion. 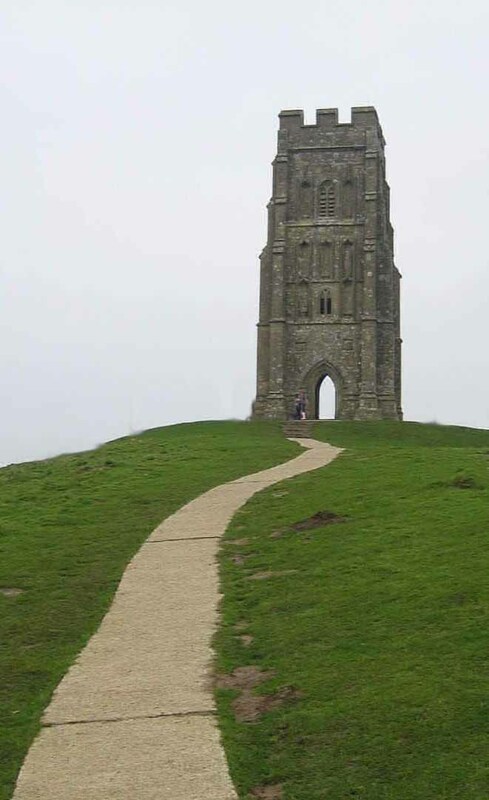 When Joseph landed on the island of Avalon, he set foot on Wearyall Hill - just below the Tor. Exhausted, he thrust his staff into the ground, and rested. By morning, his staff had taken root - leaving a strange oriental thorn bush-the sacred Glastonbury Thorn. For safe keeping, Joseph is said to have buried the Holy Grail just below the Tor at the entrance to the Underworld. 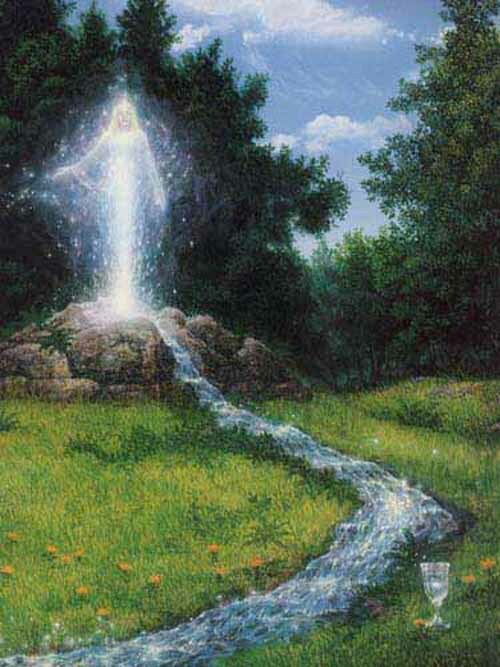 Shortly after he had done this, a spring, now know as Chalice Well, flowed forth and the water that emerged brought eternal youth to whosoever would drink it. 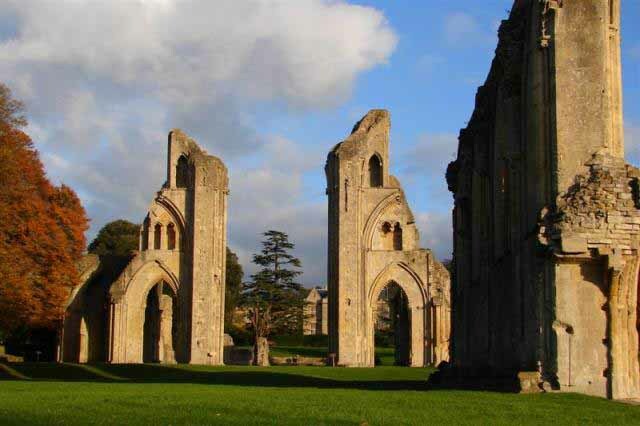 Intertwining the myths and legends of Glastonbury Abbey's history, it is widely believed that finding The Holy Grail Joseph is said to have hidden was years later the purpose behind the quests of King Arthur and the Knights of the Round Table. In 1191, monks at the abbey claimed to have found the graves of Arthur and Guinevere to the south of the Lady Chapel of the Abbey church, which was visited by a number of contemporary historians including Giraldus Cambrensis. The remains were later moved and were lost during the Reformation. Many scholars suspect that this discovery was a pious forgery to substantiate the antiquity of Glastonbury's foundation, and increase its renown. 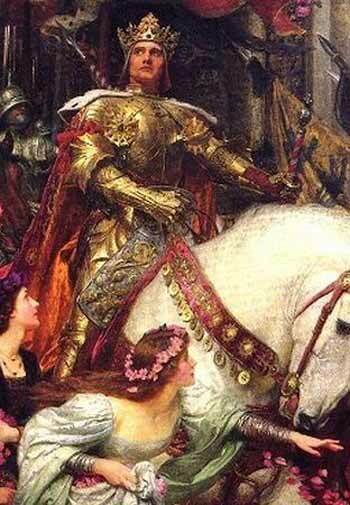 In some Arthurian literature Glastonbury is identified with the legendary island of Avalon. 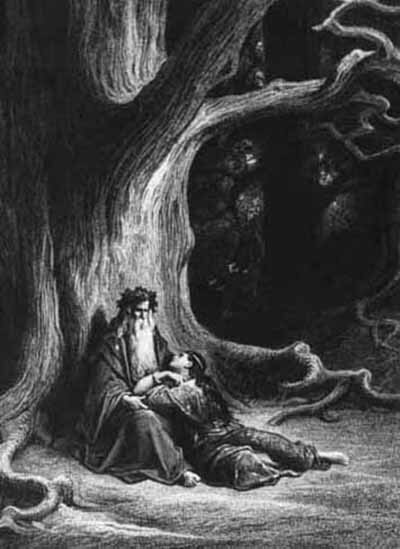 An early Welsh poem links Arthur to the Tor in an account of a confrontation between Arthur and Melwas, who had apparently kidnapped Queen Guinevere. According to some versions of the Arthurian legend, Lancelot retreated to Glastonbury Abbey in penance following the death of Arthur. Joseph is said to have arrived in Glastonbury by boat over the flooded Somerset Levels. On disembarking he stuck his staff into the ground and it flowered miraculously into the Glastonbury Thorn (or Holy Thorn). This is the explanation of a hybrid hawthorn tree that only grows within a few miles of Glastonbury, that flowers twice annually, once in spring and again around Christmas time (depending on the weather). Each year a sprig of thorn is cut, by the local Anglican vicar and the eldest child from St John's School, and sent to the Queen. The original Holy Thorn was a centre of pilgrimage in the Middle Ages but was chopped down during the English Civil War (in legend the roundhead soldier who did it was blinded by a flying splinter). A replacement thorn was planted in the 20th century on Wearyall hill (originally in 1951 to mark the Festival of Britain; but the thorn had to be replanted the following year as the first attempt did not take). Many other examples of the thorn grow throughout Glastonbury including those in the grounds of Glastonbury Abbey, St Johns Church and Chalice Well. Today, Glastonbury Abbey presents itself as "traditionally the oldest above-ground Christian church in the World," which according to the legend was built at Joseph's behest to house the Holy Grail, 65 or so years after the death of Jesus. The legend also says that earlier Joseph had visited Glastonbury along with Jesus as a child. The legend probably was encouraged in the mediaeval period when religious relics and pilgrimages were profitable business for abbeys. William Blake mentioned the legend in a poem that became a popular hymn, 'Jerusalem' (see And did those feet in ancient time). Glastonbury Abbey was a rich and powerful monastery in Glastonbury, Somerset, England. Since at least the 12th century the Glastonbury area was frequently associated with the legend of King Arthur, a connection promoted by medieval monks who asserted that Glastonbury was Avalon. The abbey was suppressed during the Dissolution of the Monasteries under King Henry VIII of England. The ruins and associated buildings are open today as a visitor attraction. Chalice Well is a holy well situated at the foot of Glastonbury Tor in the county of Somerset, England. The natural spring and surrounding gardens are owned and managed by the Chalice Well Trust (registered charity no. 204206), founded by Wellesley Tudor Pole in 1959. Archaeological evidence suggests that the well has been in almost constant use for at least two thousand years. Water issues from the spring at a rate of 25,000 gallons per day and has never failed, even during drought. Iron oxide deposits give water a reddish hue, as dissolved ferrous oxide becomes oxidized at the surface and is precipitated. Like the hot springs in nearby Bath, the water is believed to possess healing qualities. 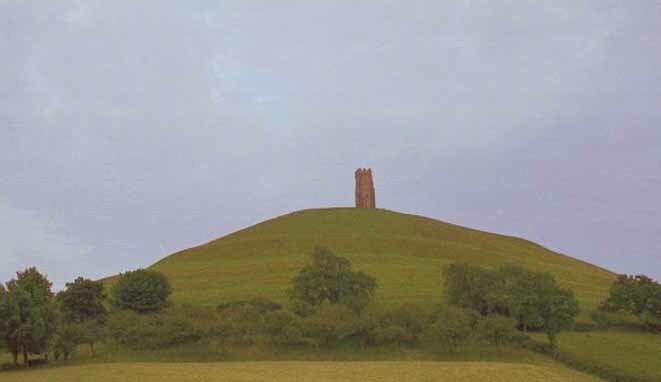 In addition to the legends associated with Glastonbury, the Well is often portrayed as a symbol of the female aspect of deity, with the male symbolized by Glastonbury Tor. As such, it is a popular destination for pilgrims in search of the divine feminine, including modern Pagans. The Well is however popular with all faiths and in 2001 became a World Peace Garden. Wells often feature in Welsh and Irish mythology as gateways to the spirit world. The overlapping of the inner and outer worlds is represented by the well cover, designed by the church architect and archaeologist Frederick Bligh Bond and presented as a gift after the Great War in 1919. The two interlocking circles constitute the symbol known as the Vesica Piscis. 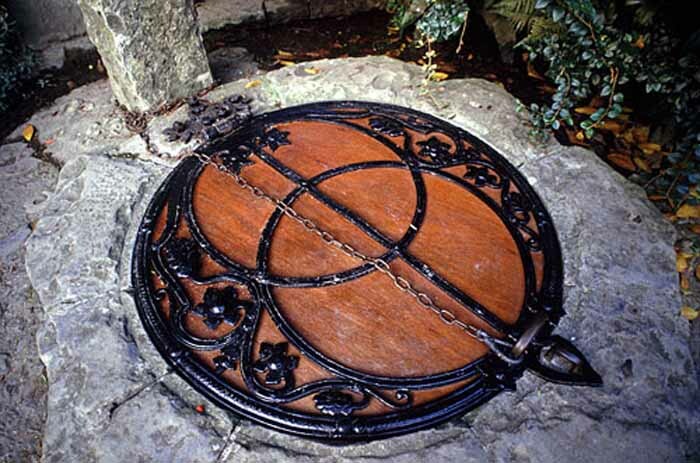 In the well lid design, a spear or a sword bisects these two circles, a possible reference to Excalibur, the sword of the legendary King Arthur, believed by some to be buried at the nearby Glastonbury Abbey. Foliage represents the Glastonbury Holy Thorn. 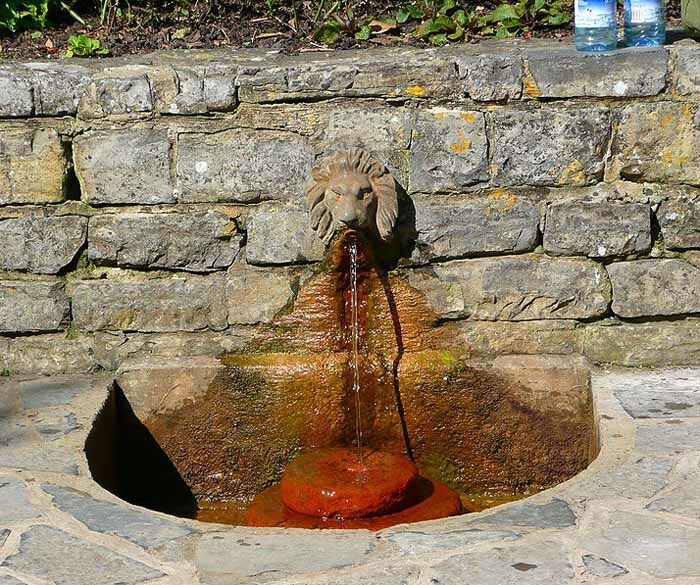 Christian mythology suggests that Chalice Well marks the site where Joseph of Arimathea placed the chalice that had caught the drops of Christ's blood at the Crucifixion, linking the Well to the wealth of speculation surrounding the existence of the Holy Grail. The red of the water is also said by some Christians to represent the rusty iron nails used at the Crucifixion. Frequent events are held in the grounds of Chalice Well including annual celebrations for the winter and summer solstices, World Peace Day, Easter, Michaelmas and Samhain (Halloween). It is a grade I listed building. A landscape zodiac (or terrestrial zodiac) is a map of the stars on a gigantic scale, formed by features in the landscape, such as roads, streams and field boundaries. Perhaps the best known alleged example is the Glastonbury Temple of the Stars, situated around Glastonbury in Somerset, England. The temple is thought by some to depict a colossal zodiac. The theory was first put forward in 1935 by Katherine Maltwood, an artist who "discovered" the zodiac in a vision, and held that the "temple" was created by Sumerians about 2700 BC. 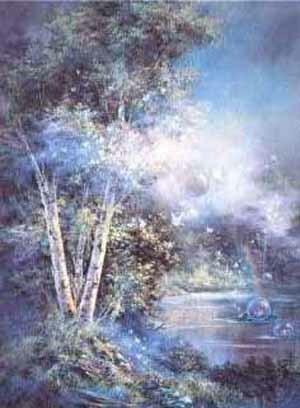 Interest was re-ignited in 1969 by Mary Caine in an article in the magazine Gandalf's Garden. The landscape zodiac plays an important role in many occult theories. It has been associated with the Celtic Saints, Grail legend and King Arthur (according to some legends buried in Glastonbury). 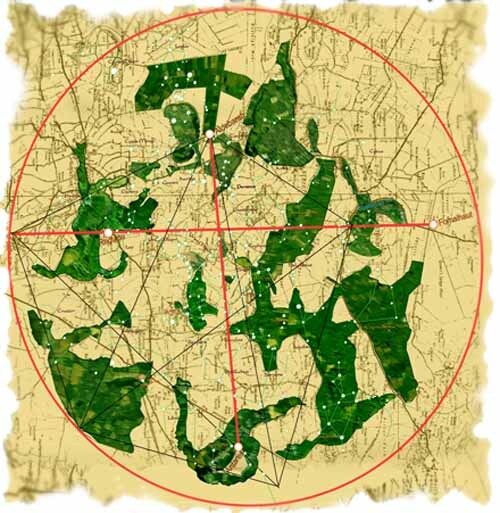 The Glastonbury Giants or Zodiac is a great landscape configuration, a circle 10 miles across. The 12 zodiac signs appear in their right order, formed by hills, outlined by roads and rivers. Katherine Maltwood who rediscovered this great circle in the 1930's claimed it as the original Round Table in Avalon with Arthur, Guinevere, Merlin and the Chief Knights still seated about it as the signs of the Zodiac and the seasons of the year. A great hound five miles long, the Girt Dog of Langport, guards this star temple. Several local legends and about 100 place-names, like Wagg on the Dog's tail, Earlake Moor on his ear, hint that these effigies were once well known. 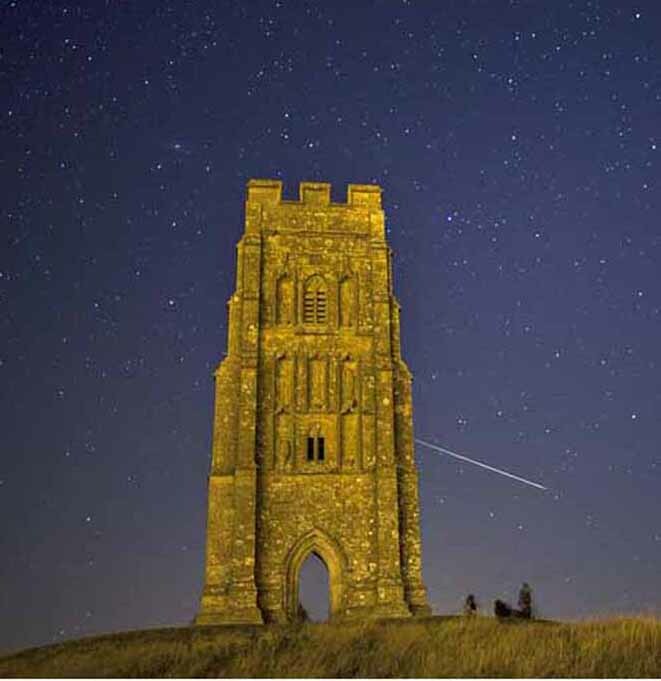 You will find Aries at Street, the Phoenix of Aquarius rises from Glastonbury Tor, and the circle continues around the Isle of Avalon. The Glastonbury Zodiac, a marvelous example of geomantic earthwork, measures 10 miles across and can be viewed totally only from the air. Hedges, roads and woods were laid out to form a ring of the 12 signs of the zodiac in the Age of Taurus as a Temple of the Stars. 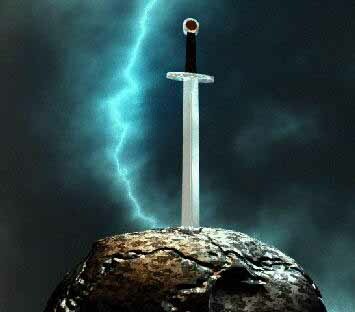 With the passage of time, successive cultures have interpreted the form according to their own myths and symbols, so the Zodiac has also been seen as an illustration of King Arthur�s Round Table and the quest for the Holy Grail. Parkwood in the center of the Zodiac represents the Pole Star, a point of stillness in the heavenly wheel. It remains today a virgin wood, like a sancturary to the soul. Perhaps the most intriguing of all Glastonbury's mysteries are the strange balls of colored lights frequently seen spiraling around the Tor. In 1970, a local police officer reported seeing eight egg-shaped objects "dark maroon in color, hovering in formation over the hill" and in 1980 a witness saw "several green and mauve lights hovering around the tower, some smaller than others, about the size of beachballs and footballs. One hovered outside the east facing window". This author spent one summer night sleeping within the tower and, waking from a dream of castles and magical beings, found the interior of the tower radiantly aglow with a luminous white light. Glastonbury, the mystic isle of Avalon is truly an enchanted place. A sacred site since time immemorial, it is often forgotten but always rediscovered. Today a major haven for pilgrims and spiritual seekers, Glastonbury is a power place of potent transformational energies.